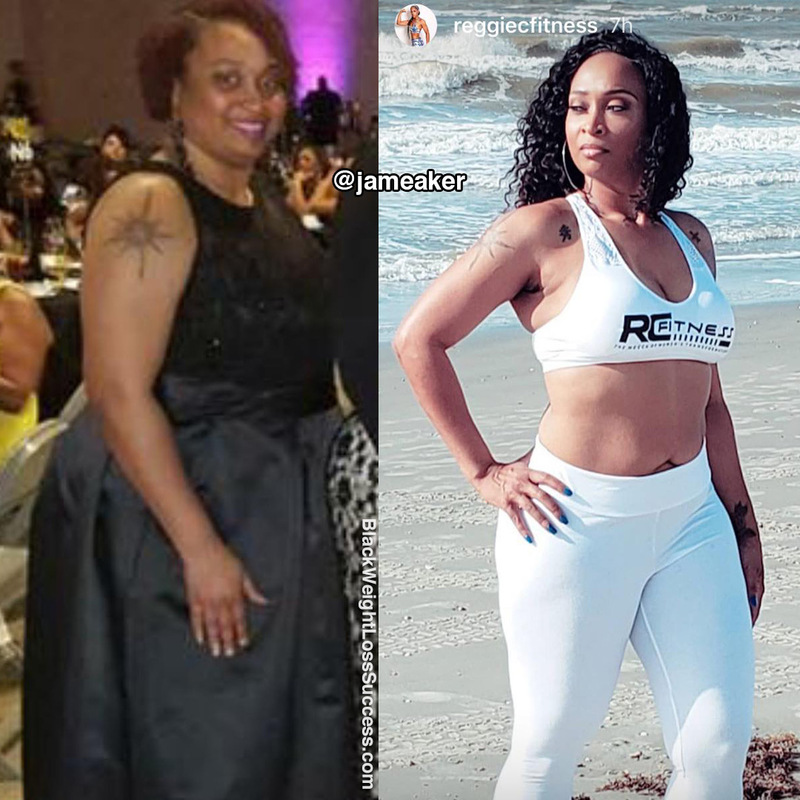 Transformation of the Day: Jameaker lost 63 pounds. After she was diagnosed with high blood pressure, she knew that taking meds for the rest of her life was not an option. It was time for change. 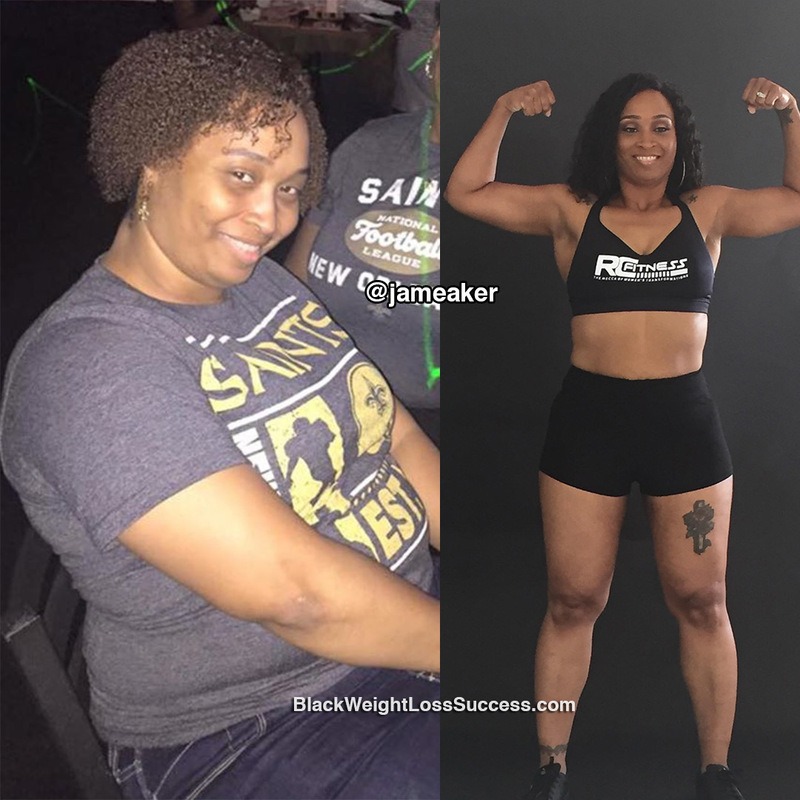 She worked with a great trainer, figured out what eating habits work for her and didn’t let the ups and downs of this journey get her down. My motivation came when I got diagnosed with high blood pressure and was put on medication. I knew I had to get a grip on my life, because I didn’t want to be on meds for the rest of my life. At first, I changed my eating habits drastically but that didn’t work because the cravings didn’t go away. (I gave in and vowed to start over on Monday.) Eventually, I slowly started to change my food choices. I’m from Louisiana and we eat EVERYTHING with white rice. I learned to substitute it for brown rice or even quinoa (I did get nasty looks from people while eating my gumbo with quinoa). I also have a huge sweet tooth! Giving up sweets was hard, but I adjusted. I ate sweet potatoes (in limited amounts of course) and bought some small squares of dark chocolate. I ate the chocolate a couple of times a week and it helped me tremendously with my cravings. Other than that, I mainly ate 1-3 oz of protein (chicken, turkey, white fish) with vegetables. I did eat some carbs, like steel cut oats or wheat bread for breakfast, and sweet potatoes or brown rice for my 2nd meal. I ate 4-5 meals a day. I worked out every day, sometimes for 4-6 hours a day. My workouts consisted of cardio and strength training. Every so often, I would take Sundays off, rest and meal prep for the week. My starting weight was 230 pounds and my ending weight was 167 pounds. I’m 5’6. I started my journey in August 2017 but didn’t get serious until October. I lost 40 pounds by the end of January 2018. Then, life happened so I ate and gained some weight back. I got mentally prepared again in May 2018. By the end of June 2018, I’d lost another 27 pounds. I had an exceptional trainer who helped me, Reggie Collier of Reggie C Fitness. I’ve learned that it’s ok to fall off. Just get back on and remember the reason why you started in the first place. What advice do you have for people who want to release the weight? My advice is that you have to be mentally prepared first for all of the ups and downs that you’re going to go through when you’re on a weight loss journey. You may have some amazing weeks with awesome progress and some weeks you may gain weight. Just stay the course and you will be victorious at the end! The decision to transform starts with the mind 1st and the physical comes 2nd. LIFESTYLE CLIENT SPOTLIGHT! #60DayChallenge DONE! Was it an easy road NO, was it perfect ABSOLUTELY not, but progress was made and that’s why we are proud of @jameaker. She stayed the course and has been victorious …and she’s just getting started. Great job, Jameaker!!! Yes congratulations to you all.